Vince Camuto one-button jacket with cuffed cropped pants, available at Dillard's, Penn Square Mall. 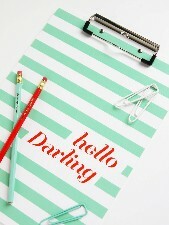 Mint and white striped clipboard, available at Pencil Shavings Studio. Vince Camuto navy medallion print top with mint stripes, available at Dillard's, Penn Square Mall. Some colors are just so tempting, it’s almost impossible not to indulge. Mint is one of those colors. And it looks good on most women. How often does that happen? “No matter what skin tone or hair color, mint flatters all,” said Alex Bratton, buyer for On a Whim stores in Oklahoma City and Tulsa. Think of mint as this season’s new neutral. “Mint is one of my go-to shades because it plays so well with all the other colors,” said Rachel Shingleton, creative director of Oklahoma City-based Pencil Shavings Studio and designer of paper goods, tech accessories and home décor items. Paired with navy, it can take on a nautical feel. Wear it with white for a fresh and clean look. Team with other pieces in turquoise, pink or yellow for a color-block effect. Mint fashion choices are plentiful this season, from cropped skinny jeans and handbags to sandals and bracelets. You can choose from sleeveless dresses, T-shirts, flirty tops and skinny belts. Pledge your love for the color with a dress or jacket or make a statement with the little things such as a chunky necklace, platform pumps or a handbag. Still not sure you want to commit to the color? Opt for mint nail polish. If you don’t like it, you’re only out a few dollars. Mint is also showing up in home décor including pillows, vases, furniture, dinnerware, linens and home office and desk accessories. So indulge in icy mint tones this season. They’re not only pretty, they’re pretty tempting.